After spending the last eight months travelling with our children, experiences can become a little bit ‘same same’. That sounds incredibly obnoxious, I know. Unique experiences are hard to come by, the longer you travel. 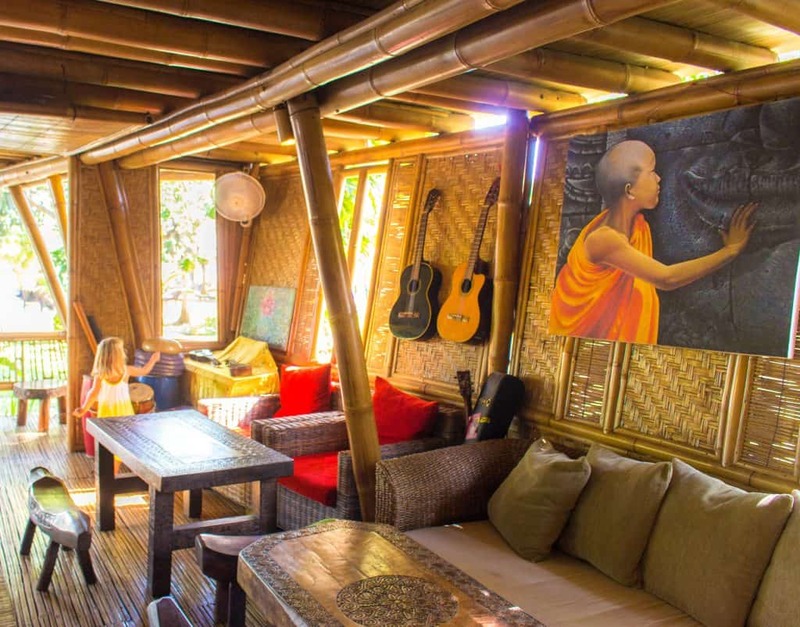 That was until we visited the Power of Now Oasis for a personalised family yoga retreat. In honesty, I hadn’t even heard of this concept before, but it’s so clever, not to mention enjoyable. We spent three nights with our two kids at Kolonial House. 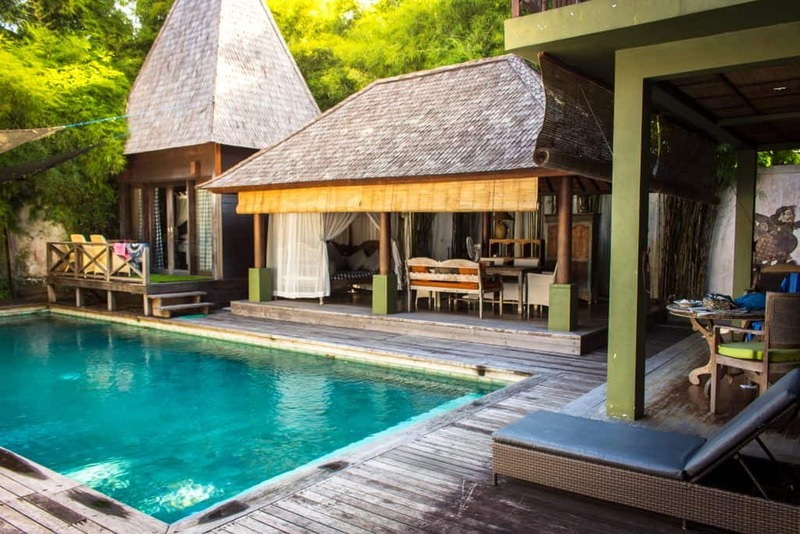 It’s a small boutique hotel owned by Power of Now Oasis owner, Chris. The studio and the house are literally 200 metres apart, so it was really easy to get between the two. Lola was our personalised retreat facilitator. She is an adorable person and we had so much fun hanging out with her. She made an incredible three day itinerary for us. 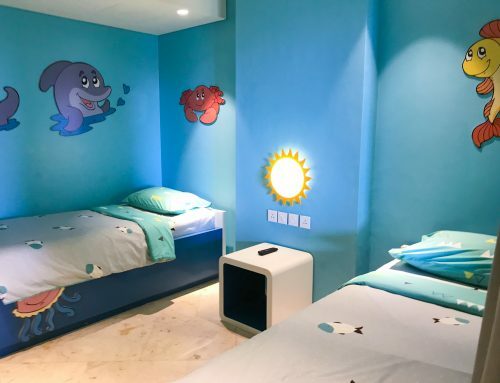 The team at Power of Now Oasis usually give a few options for an itinerary, but we went with a surprise and it was so lovely! I have never been on a retreat before so it was an entirely new experience. My favourite part was the fact we didn’t have to think about anything! Everything was organised, all we had to do was get out of bed in the morning. I loved the surprise element of it. We saw our itinerary on arrival but I wasn’t so familiar with some of the names, for example, ‘Bokashi’. Let me reveal all, in our usual format, play, sleep and eat! We arrived quite late on our first day, so once we checked in we bedded down for the night. The next morning hubby and I had an early morning Ayurveda consultation. Ayurveda is an ancient Indian medical system that works on eliminating the cause of diseases. Much of the philosophy is based on what goes into the body and what comes out. The Ayurveda doctor asked a series of questions about mental and physical well-being. He personality types each patient and gives advice based on it. For example, I am a ‘kapha’. I was given a list of foods that are good for me, what I should eat less of and what to avoid. Equally he assessed my dodgy hip and gave me some exercises to improve its strength with yoga practice in mind. I found it all really useful. Even if there was quite a bit of chat about my bowel habits and some things that made me really ‘think’ about myself. After our consultation, we went to the studio where we all had breakfast and the staff arranged an opening ceremony for us. We sat on comfy cushions and they showed us how offerings are made, what they mean and then we were welcomed. It was very relaxed and the kids could move around as they wanted. 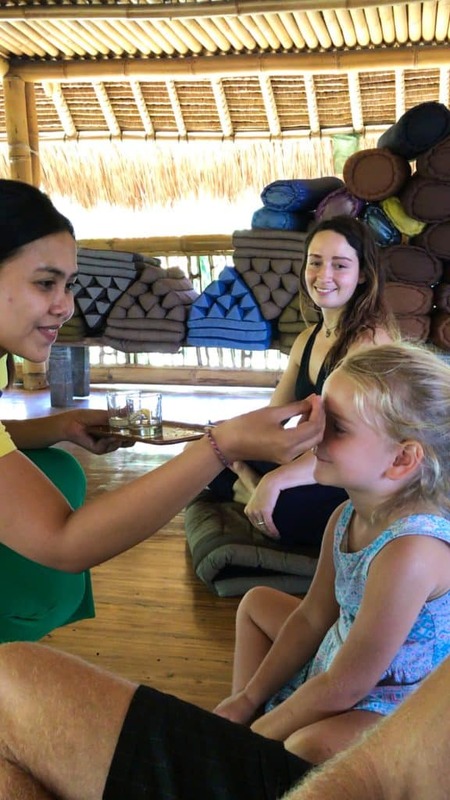 Our daughter loved getting involved and being blessed with rice grains on her forehead. We had scheduled yoga classes every day but they were incredibly flexible with us. Sometimes it was better for me to go in the morning, or maybe a later class. You know how it goes with kids, they don’t always work to timetables so the flexibility was great for us. I really loved the classes. I tried Hatha flow with Menik and Iyenger yoga with Lisa. Its always good to try different things and Iyenger yoga was certainly different. The studio is beautiful. 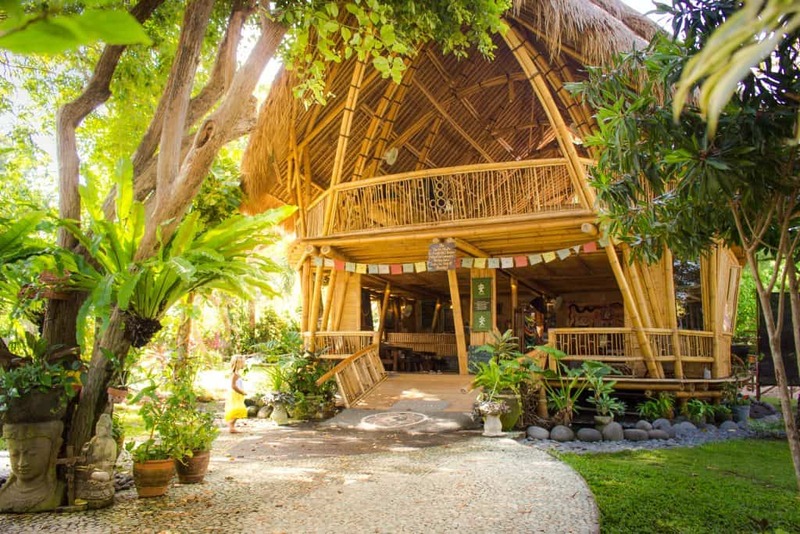 Its in a large bamboo eco structure right on the beach. It’s such a peaceful space and I love the setup. Especially Angelique the sacred cow who was living on the land long before the studio was built! The studio has such a community focus and is very involved in charitable work. Every week, they invite the children from Jodie O’Shea’s orphanage for a yoga lesson. Likewise they come for a movie night once a month. It’s a tradition that has been going on at the studio for some time. The public can attend the class as well. We brought our little one along. It’s usually on a Wednesday evening and is a lot more fun and light hearted than a normal yoga class. I am sure you are starting to get a feel for how amazing the owner Chris is, right? Ok so my first question was, what is Bokashi? Lola asked me if I wanted a surprise, so I decided to go with it and just wait to see what happened. We were picked up from Kolonial House in a car. 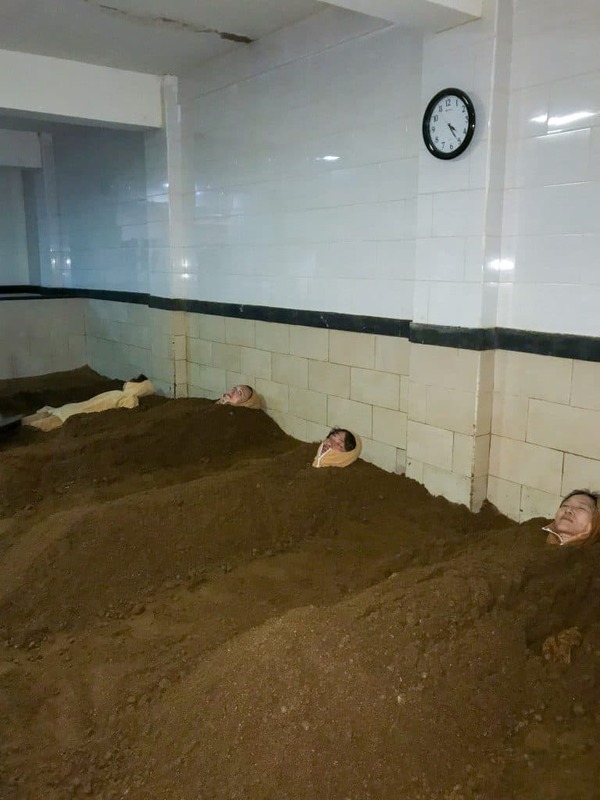 They took us about twenty minutes away to what looked like a spa. Initially we had a very deep tissue massage. The kids were with us, they were quite happy for them to sit in between our legs and they gave them a mini massage to keep them happy. Afterwards we were brought downstairs and that’s where the fun began! We took turns and dressed in what looked like an in-mate uniform. There was no hole for my hands or feet. Just a hood and a zip up the middle. It sounds crazy, but I was buried in a pile of roasting hot herbs and compost. The idea is to secrete all of the toxins in a process of ‘taking away the layers’. It was incredibly hot and I have to say one of the most unique experiences I’ve had in a long time. Afterwards we were given lemongrass tea and a towel to shower. I absolutely loved it and my daughter thought it was hilarious. Power of Now Oasis can arrange lots of different adventure activities. Stand up paddle boarding, surfing or kiteboarding for the more daring. Paddle boarding is quite good because we could take the toddler on the board just off the beach. We hired a babysitter one of the mornings and went on a surfing lesson. The fact I stood up a couple of times was pretty cool. 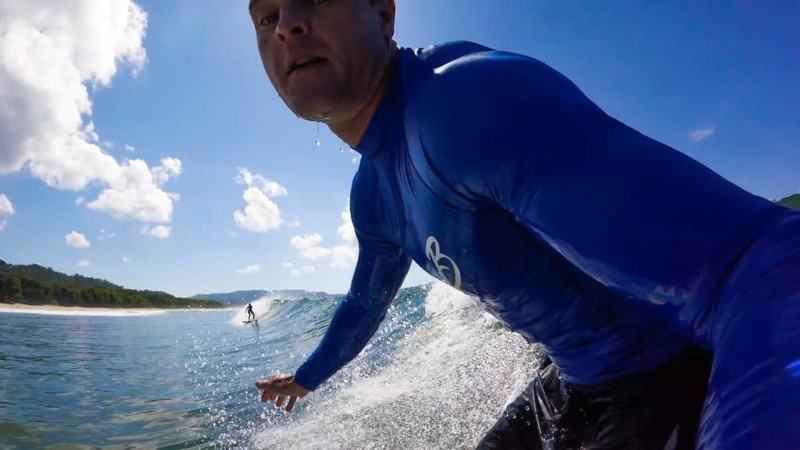 I have been trying to surf a lot over the last few months whenever the opportunity arises. I was thinking maybe the yoga was helping a little with balance? Power of Now Oasis were amazing! They had two bicycles with kids seats at the ready when we arrived. 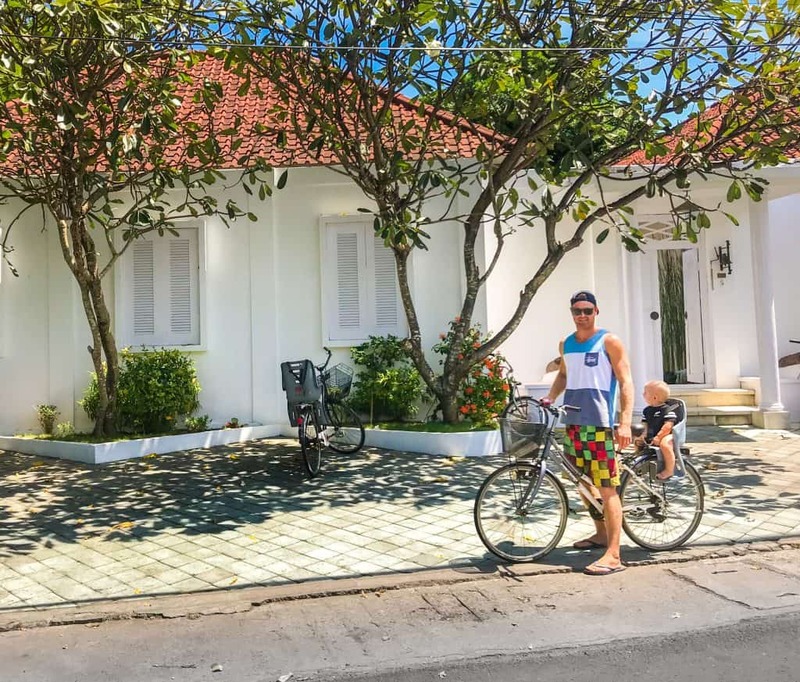 We used them to get to and from the yoga studio and generally explore Sanur. 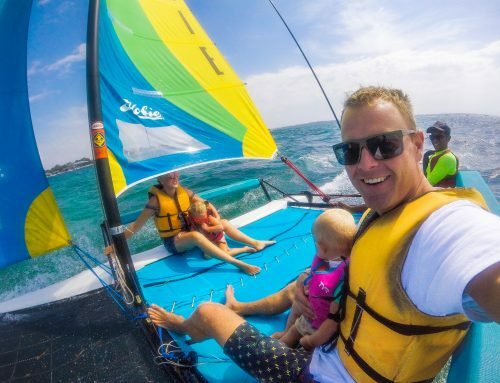 The kids loved going for a ride, especially along the beachfront. It was a really safe place to cycle and probably the best way to get around. 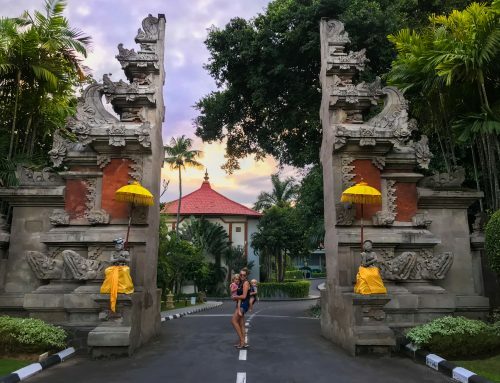 We’ve been in Bali for quite some time now and I’ve been wondering why I didn’t think of that before. I loved cycling to the morning yoga class. The streets were quiet and the air was still cool. It was the perfect way to clear the mind before hitting the mat. Power of Now Oasis know all of the best places around town, wether it’s a restaurant, or a spa. They took us to a really lovely spa for a one hour Balinese massage. Esme and I had pedicures whilst hubby had his turn. When it was my turn, he took the kids back to the hotel room. We had a choice from three different massage oils. The environment was so peaceful and serene. We were welcomed with ginger drinks and a cold face cloth. The massage was divine! Kolonial House is such a fabulous part of the retreat. As much as we were doing some lovely activities, we had plenty of time to relax and enjoy the cutest little boutique hotel. Centred around a swimming pool are two villa style apartments. 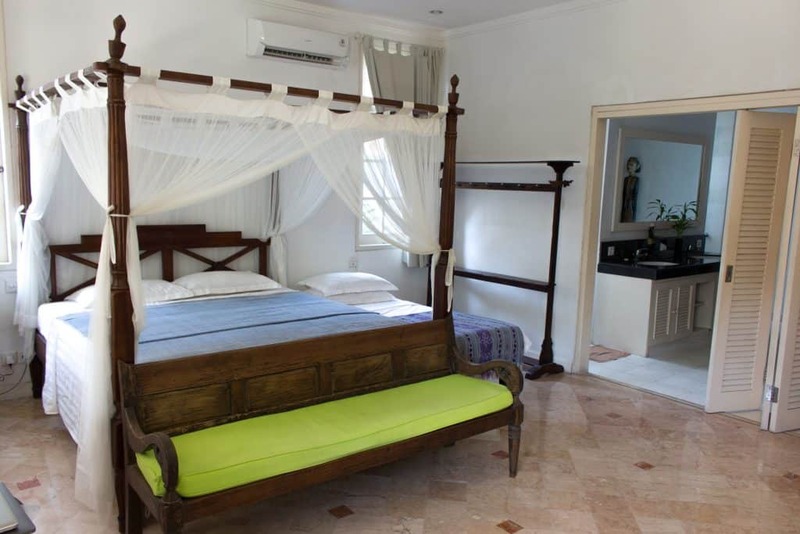 Being ‘colonial’ they have high ceilings, four post beds and some really lovely antique furnishings. We loved the outdoor kitchen. Unlike a regular hotel, its always nice to have facilities to whip up the kids favourite snacks. I also loved the communal feel of Kolonial house. The staff are all lovely and incredibly helpful. As is owner Chris who lives onsite. He was amazing for giving us tips and advice for our stay. I always worry about taking our kids to smaller more intimate places. We all know what ‘witching hour’ can be like. He was so welcoming of the little ones and said they loved having children around. That made us feel a lot better about any epic meltdowns. We visited the studio every morning for our breakfast. The food is so good. Its made to order omelettes, oats or freshly chopped fruits with granola and yoghurt. They have lots of really good freshly pressed juices and smoothies. 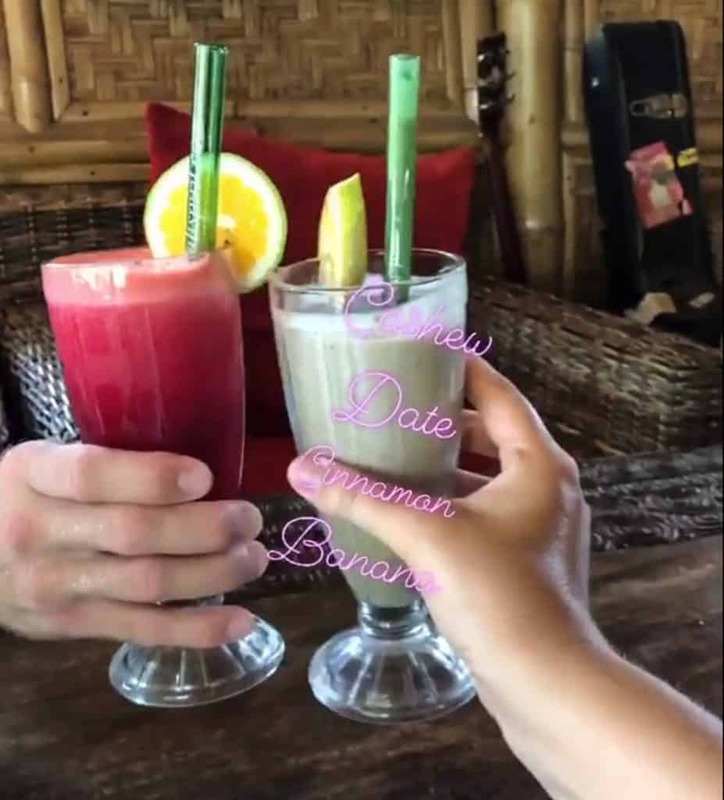 My personal favourite was the cashew, date, banana and cinamon smoothie. It was so good, especially after yoga class. Likewise, they offered us lunch every day at the studio. Everything is super healthy and tasty. It’s seriously heaven for anyone vegan. We had their homemade curry two days in a row. It was delicious. When I asked them for the recipe, it was so simple, I hope I can re-create it when we get home. 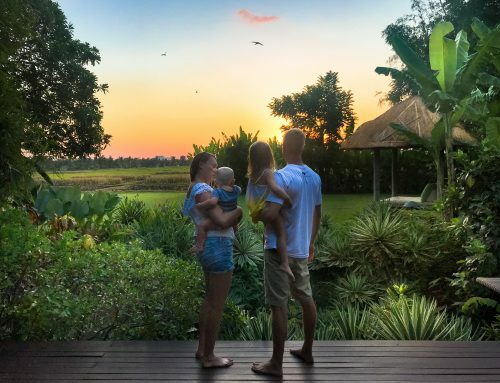 The entire concept of a ‘ personalised family yoga retreat’ is quite new in my opinion. It’s such a great idea and if you are a yogi, it makes the holiday about everyone in the family rather than completely concentrated on the kids. They are very adaptable at Power of Now Oasis, so if you give them some ideas they can help you out. 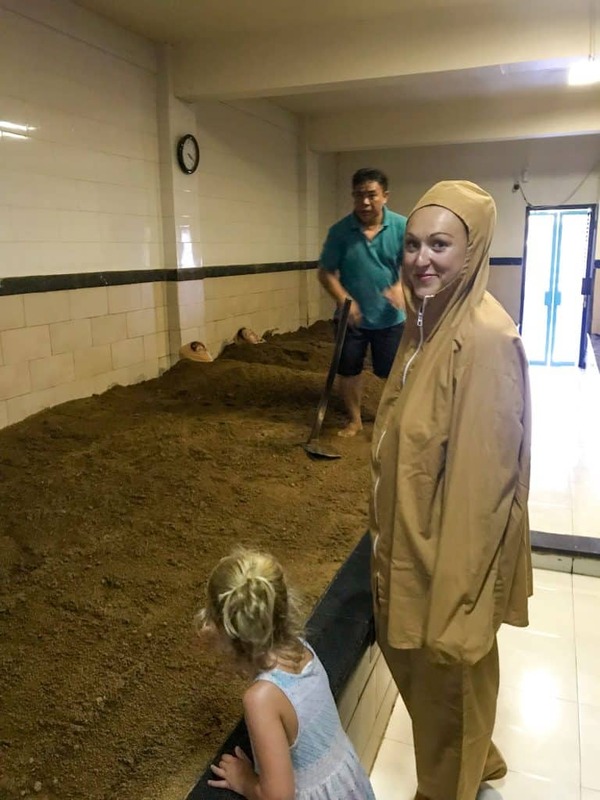 I highly recommend this experience for something unique and different. 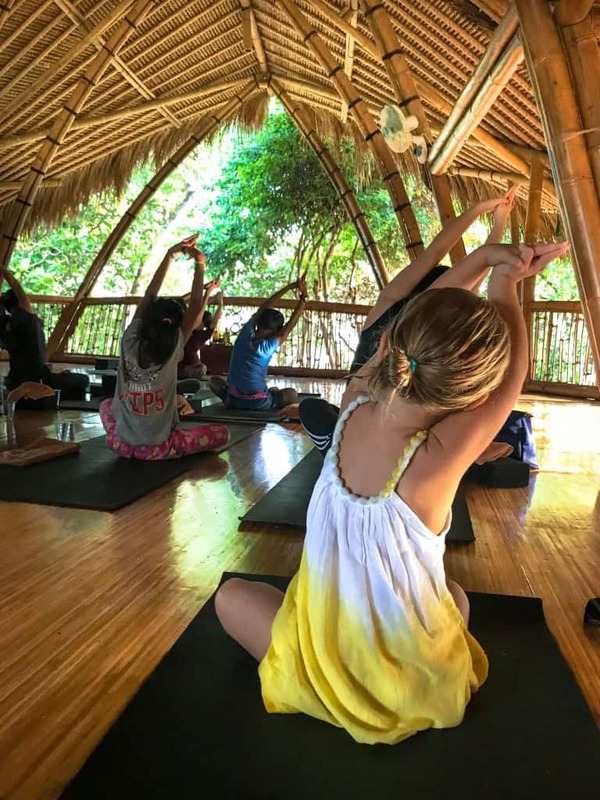 Have you found this family yoga retreat helpful? Leave a comment, we would love to hear from you. If we’ve helped you in some way, we would love if you could help us too. In this digital age there is a demand for immediate information online. Being a patron is a new-age way of giving a small token of appreciation for this information, which takes time to put together, with no financial return. We offer exclusive access to blog posts before they are published as a thank you. We also offer travel advice and consultancy at different payment tiers. You can sign up to our Patron program here. 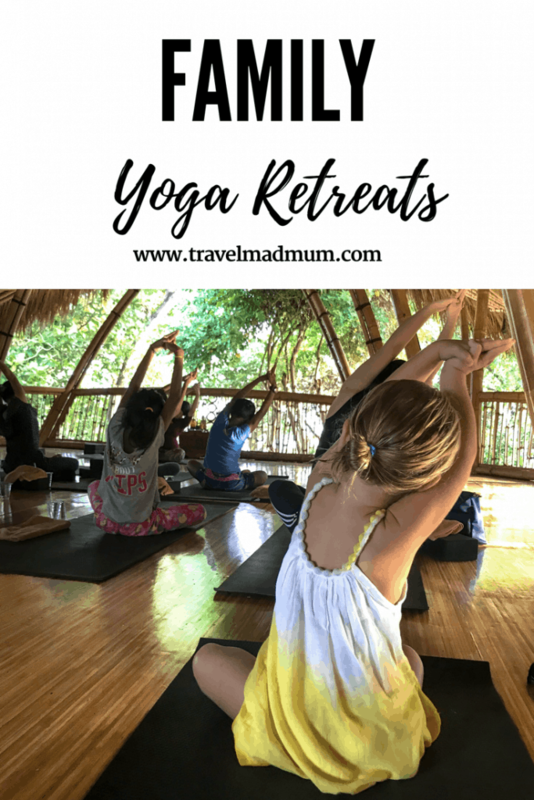 Disclaimer: This post family yoga retreat has affiliate links. Some of our stay was complimentary in return for an honest review. As always all views expressed are entirely my own. This sounds amazing!! I’m always trying to think of ways I can do yoga and get the family involved!